So where are these cheap pen-enabled screens? They're called Microsoft Tablet PCs and they were "the next big thing" only a few years ago. Microsoft spent a lot of money and effort trying to persuade us all we wanted to carry around a laptop to write our notes on, only to realise that the idea was another cul-de-sac of doom. But whilst the mass market never materialised, these machines have got one magic ingredient: Wacom digitisers built-in. So for an experiment, I decided to find out how near I could get to a Cintiq-like pen-enabled screen for less than £100. A quick search led me to several models including ones from Lenovo, HP Compaq and Panasonic. The price limit meant ignoring anything less than five years old, but that still left a large range to choose from. In the end I plumped for an Acer TravelMate C300, which cost me the princely sum of £50 plus postage. This model has some issues, but the primary advantage is the screen size - 14-inch rather than the more common 12-inch. Since my intention was never to use this as a laptop but simply as an input device, the added weight of a larger screen was no problem. I was careful to check that my Tablet PC came with the stylus, as obtaining replacements is not cheap, if you can find one at all. Wacom still offers specific drivers for their tablet pc digitiser (last updated June 2012) and if you are happy to tinker, you can also move to Linux and keep most of the hardware working. I opted to keep the existing OS for testing, and a quick update of Windows XP Tablet PC Edition later, I was doodling away to my hearts content. 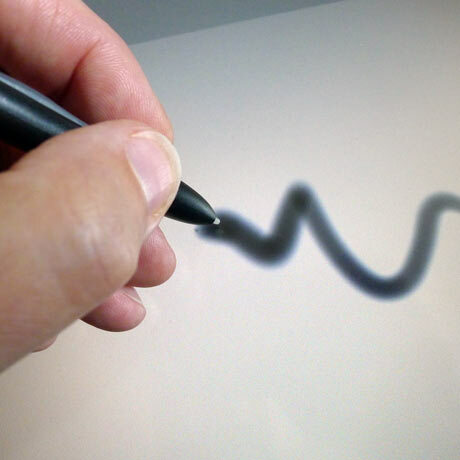 Once I configured the tablet hardware buttons to map to eyedropper and increase/decrease brush size, using Photoshop was remarkably straightforward, and sketching or retouching was a genuine pleasure. I ended up using a shared network folder for files, so that I could create and edit on the tablet, before final tweaks and output via the desktop machine - not a perfect workflow but good enough. Did I mention it cost £50? So in conclusion, if you would like a pressure-sensitive drawing screen with modern drivers and great connectivity, try a seven-year-old Tablet PC.